This statue was built of sandstone and concrete between 1922 and 1931 in Rio de Janeiro. It is perched on a mountain overlooking the city in Brazil. 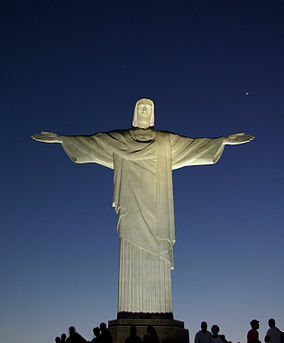 It’s the largest art deco statue in the world and the fifth largest statue of Jesus in the world. It is 130 feet tall. I think it is breathtaking in photos and would love to see it one day in person. I have a character in one of my stories who goes to Rio on a mission and she sees this statue while on a cab ride. I loved researching that area of the world. « Special Guest, Jaydyn Chelcee and A Giveaway! YAY!! That is a gorgeous statue and, like you, I’d like to see it in person one day. It’s a long flight, but I’d love to go. Hopefully, we can both do so someday. Yep. It’s on my bucket list. Me too, me too. Would love to go to Rio. Let’s plan a girls trek to S. America, Lavada! Yeah, I have to wait too. Crazy world right now at my house. LOL!